Blockchain is beginning to enter the spotlight as organisations see uses for it over and above the cryptocurrency Bitcoin. From combating fake degrees to being able to track the origin of organic products, blockchain is proving to be a reliable solution in trust. The underlying technology that powers cryptocurrencies like Bitcoin and ethereum is blockchain. Creating trust in transactions Varanasi: Blockchain can be used to store verified documents so that users don’t have to keep validating important documents every time it’s submitted to a new party. While blockchain was confined to finanin cial tech the early days, many organisations are starting to employ it in other industries because the technology is highly secure and even allows for transparency. This encourages trust and in some cases even eliminates the need for a third party to validate the data, making it valuable to many organisations. WITH fake doctorates and degrees becoming increasingly common, how are employers and graduates to find an efficient way to bridge the gap in trust? 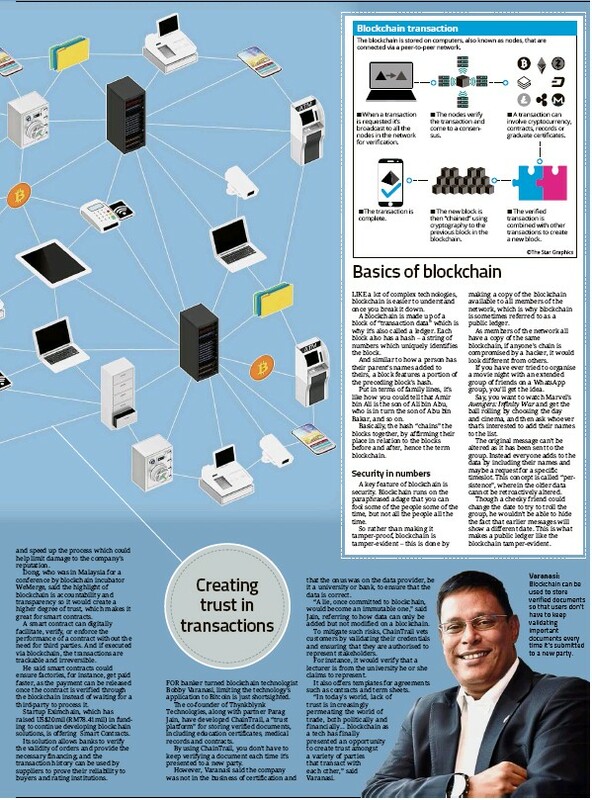 According to Dr Mohamed Ariff Ameedeen, from University Malaysia Pahang (UMP), the solution could lie with blockchain technology. As director of IBM’s Centre of excellence, which has been based in the university since 2012, he is continuously exploring novel uses for blockchain beyond cryptocurrency. he said one of the early ideas the team was working on was a secure database that would prevent students from hacking to change their grades. however, his team then decided to solve a more pressing issue affecting universities – fake degrees. Mohamed Ariff said some universities are already integrating QR codes into graduates’ certificates to help validate credentials. however, even QR codes are now easily tampered with. Taking it one step further, the UMP team created a system called Valid8, a QR code linked to a student profile secured by blockchain, which contains the student’s name, photo, title of degree and the year it was awarded. This made tampering with the QR code pointless, as it only acted as a key to the information on the blockchain. “even if someone used another person’s QR code, the data would clearly show it was not the person’s name or photo connected to the certificate,” he said. he added that all the info placed on the blockchain is already publicly available so it would not compromise the students’ privacy. Mohamed Ariff said making the data trustworthy meant time savings – as employers don’t have to contact the university to verify the certificate, they can be quicker in deciding if they should hire the job applicant. So far, UMP has run a pilot programme with Valid8 by issuing supplementary certificates to 180 graduates from the industrial Management Faculty. Mohamed Ariff said it took a couple of days to configure the blockchain node and a few more days to input the 180 students’ data. “Although entering the information is relatively straightforward, migrating 15 years of old data (of earlier graduates) that includes more than just the initial four data points is going to take a bit longer,” he said. The full-scale test for Valid8 will be the students graduating at the year-end convocation, estimated to be around 2,000. To make the student profiles more useful, Mohamed Ariff said the team is planning to add more information such as grades, attendance, courses and maybe even disciplinary records. “The beauty of blockchain is that it can grow with time and track a student’s academic life. imagine how much data it would have if a profile was set up for students when they entered kindergarten,” he said. To encourage such a situation, UMP is open to collaborating with other universities that wanted to adopt blockchain for student iDs. however, eduValue founder Barry Ew Yong warned that even a secured system has an obvious point of failure – human error. he added that once errors entered the system there is a chance that it will be perpetuated. “Technology does not increase trust. Systems increase trust, though technology can be a useful tool to do so,” he said. Like with UMP’s Valid8, the quality assurance startup has adopted blockchain to secure graduate certificates, using the technology to store a softcopy of the degree. 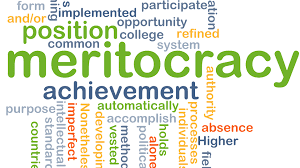 The company serves around 30 private schools, mostly tertiary schools offering up to Masters. Founded in Singapore in December 2012, it only just started employing blockchain. he said the company uses a two stage system to ensure that only qualified students would be given certificates. in the first stage it will help set up the standard by which students will be evaluated in order for them to graduate, and the approval process will be audited – schools found lacking will be struck off the system. in the second stage it will vet all data being uploaded to the platform. 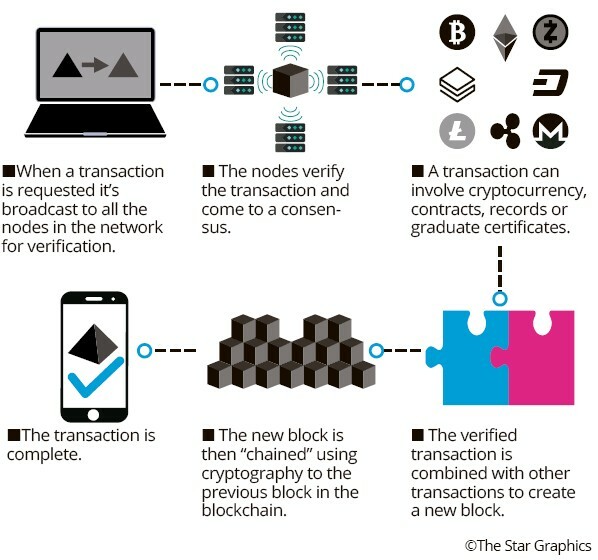 For UMP this is just a start – it’s also testing a blockchain based e-wallet called Xchain that students, lecturers, staff and vendors would eventually use for all transactions in UMP. Beyond the security benefits, Mohamed Ariff said the open-nature of blockchain’s shared ledger meant the spending patterns could be analysed, making the university a giant data pool. “With a population of 13,000 users, there’s a lot of potential data. And as a university, we love data,” he said. Xchain is still in beta as the team is waiting to get Bank Negara to issue it an e-wallet license. Mohamed Ariff concluded that blockchain is promising, especially for the education field, which relies on data that is open to peer review while also being trustworthy and tamper-evident. ACADEMICIAN hu Dong, who advises Shanghai Jiaotong University’s Zero Bay incubator, said the supply chain industry could see huge advantages by having a more efficient and transparent data manto agement system. Blockchain can be used track a product’s origin and determine if the materials were sourced as claimed, which is invaluable to sectors such as organic farming and ethical diamond mining. Also, by tracking the product’s trail along each stop on the supply chain, should an issue arise that requires a product to be recalled, the company could zero in on where the fault occurred. For example, if a company found that the computer it’s making has a faulty hard drive, it would be able to identify which one of its factories was responsible. it then only needs to recall the computers that originated from the affected factory instead of all its products. and speed up the process which could help limit damage to the company’s reputation. Dong, who was in Malaysia for a conference by blockchain incubator WeMerge, said the highlight of blockchain is accountability and transparency so it would create a higher degree of trust, which makes it great for smart contracts. A smart contract can digitally facilitate, verify, or enforce the performance of a contract without the need for third parties. And if executed via blockchain, the transactions are trackable and irreversible. He said smart contracts could ensure factories, for instance, get paid faster, as the payment can be released once the contract is verified through the blockchain instead of waiting for a third-party to process it. Startup Eximchain, which has raised US$20mil (rM78.41mil) in funding to continue developing blockchain solutions, is offering Smart Contracts. Its solution allows banks to verify the validity of orders and provide the necessary financing; and the transaction history can be used by suppliers to prove their reliability to buyers and rating institutions. For banker turned blockchain technologist Bobby Varanasi, limiting the technology’s application to Bitcoin is just shortsighted. The co-founder of Thynkblynk Technologies, along with partner Parag Jain, have developed ChainTrail, a “trust platform” for storing verified documents, including education certificates, medical records and contracts. By using ChainTrail, you don’t have to keep verifying a document each time it’s presented to a new party. However, Varanasi said the company was not in the business of certification and that the onus was on the data provider, be it a university or bank, to ensure that the data is correct. “A lie, once committed to blockchain, would become an immutable one,” said Jain, referring to how data can only be added but not modified on a blockchain. To mitigate such risks, ChainTrail vets customers by validating their credentials and ensuring that they are authorised to represent stakeholders. For instance, it would verify that a lecturer is from the university he or she claims to represent. It also offers templates for agreements such as contracts and term sheets. 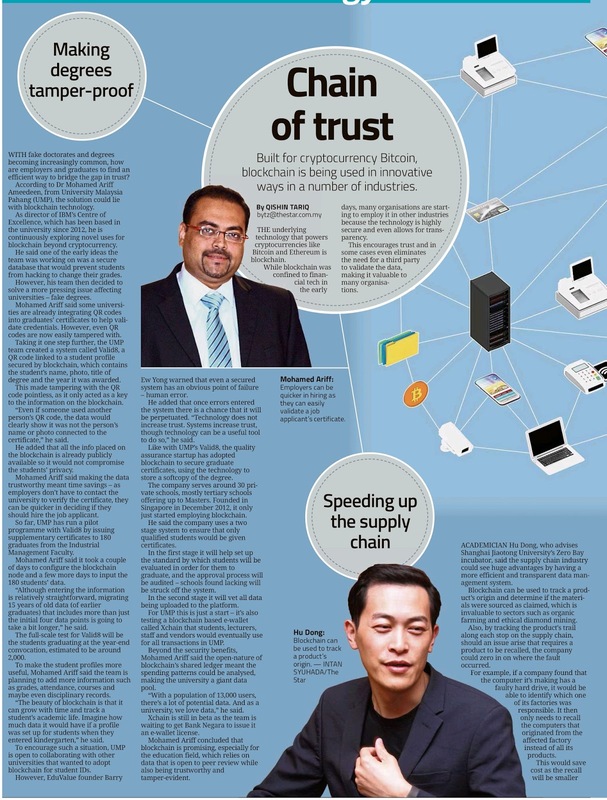 “In today’s world, lack of trust is increasingly permeating the world of trade, both politically and financially... blockchain as a tech has finally presented an opportunity to create trust amongst a variety of parties that transact with each other,” said Varanasi. Built for cryptocurrency Bitcoin, blockchain is being used in innovative ways in a number of industries. LIKE a lot of complex technologies, blockchain is easier to understand once you break it down. A blockchain is made up of a block of “transaction data” which is why it’s also called a ledger. Each block also has a hash – a string of numbers which uniquely identifies the block. And similar to how a person has their parent’s names added to theirs, a block features a portion of the preceding block’s hash. Put in terms of family lines, it’s like how you could tell that Amir bin Ali is the son of Ali bin Abu, who is in turn the son of Abu bin Bakar, and so on. Basically, the hash “chains” the blocks together, by affirming their place in relation to the blocks before and after, hence the term blockchain. A key feature of blockchain is security. Blockchain runs on the paraphrased adage that you can fool some of the people some of the time, but not all the people all the time. So rather than making it tamper-proof, blockchain is tamper-evident – this is done by making a copy of the blockchain available to all members of the network, which is why blockchain is sometimes referred to as a public ledger. As members of the network all have a copy of the same blockchain, if anyone’s chain is compromised by a hacker, it would look different from others. If you have ever tried to organise a movie night with an extended group of friends on a WhatsApp group, you’ll get the idea. Say, you want to watch Marvel’s Avengers: Infinity War and get the ball rolling by choosing the day and cinema, and then ask whoever that’s interested to add their names to the list. The original message can’t be altered as it has been sent to the group. Instead everyone adds to the data by including their names and maybe a request for a specific timeslot. This concept is called “persistence”, wherein the older data cannot be retroactively altered. Though a cheeky friend could change the date to try to troll the group, he wouldn’t be able to hide the fact that earlier messages will show a different date. This is what makes a public ledger like the blockchain tamper-evident. The blockchain is stored on computers, also known as nodes, that are connected via a peer-to-peer network.